There is no lack of innovation in the field of cable management systems for wires, cables and optical fibers. Not so surprising as cable management systems represent a significant cost in labor and are key to the networks distribution strategy. 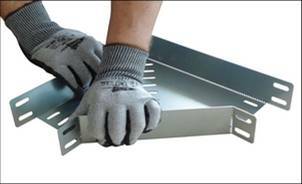 One could think that cable trays in steel wire or in sheet metal have reached a peak in innovation. Manufacturers are always launching new functions or new assembly methods in order to stand out in a very competitive market. The overall trend is the simplification of ranges and thus the speed of installation. Distributors (who want to stock references and accessories always more polyvalent and less bulky), installers and their subcontractors (in permanent search of saving time on the worksite) are directly concerned. CTS : stored flat, this angle will be quickly shaped when the time comes. CTS with its brand CES, proposes for example intuitive assembly solutions while trying to limit the need for cut-outs as much as possible. Cut-outs constitute indeed a waste of time and increase the risks of accidents. Besides, this manufacturer should soon launch a significant improvement for the standard rail 41x41mm, integrating more functions… and fewer accessories. Gewiss offers a variable-angle elbow named Maricurve that adjusts without cut-outs. A plier or a hammer are sufficient to initiate the needed deformation and to adapt the angle at the worksite. All this based on one single element delivered straight. This accessory ensures an automatic coupling and guarantees ground continuity.